My Second Life as Amariah Francis: 60L Monday! For Whit Dresses! 60L Monday! For Whit Dresses! 60L WEEKEND extended till MONDAY! WOOOT! I was out on RL vacation for the weekend and I totally forgot to send out notices and post this to my blog. 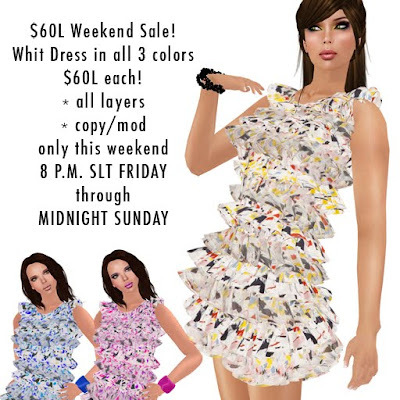 So my blunder is your gain, I am keeping the Whit Dress on sale for Monday, too! Until Monday midnight! 60L Weekends Sale on Missy Skin Line!